Everybody has a dark side. Us will tell the story of Adelaide Wilson (Lupita Nyong'O), who sets off with her husband Gabe (Winston Duke) and their two children for a vacation trip to her childhood home. A series of weird coincidences feed into her mounting, unexplained paranoia, and when night falls, a quartet of mysterious figures appear at their beach house. These are no standard-issue home invaders; the family find themselves facing off with creepy doppelgängers of themselves who don't appear to have dropped by for a midnight snack. 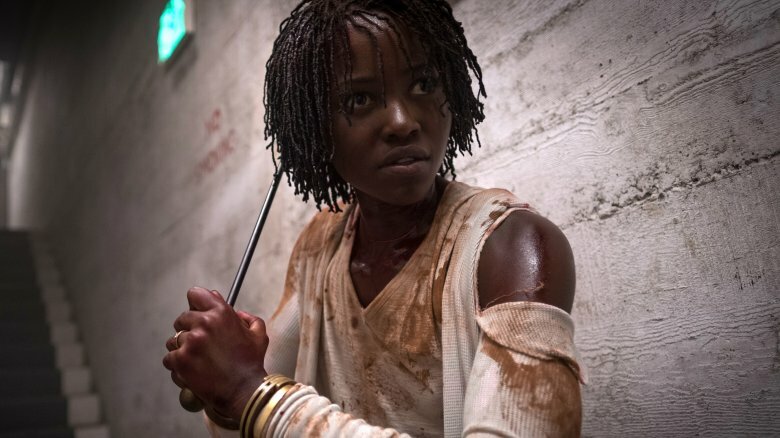 The new one-sheet features Nyong'O's doppelgänger character, dressed in the red garb and fingerless leather gloves we've seen all the doubles wearing in the flick's trailers, staring into your soul with one haunted eye as she slips aside the mask of normality representing her smiling, laid-back counterpart. As if we needed any more convincing that this will be one of the scariest films we've seen for a long, long time, it's an image that may make the viewer feel like they're about to crack if they meet that spooky gaze for too long. It also reminds us that Nyong'O is one of the most talented actresses working today, capable of giving us a full-body case of the heebie-jeebies with one still photo. Those trailers suggest that she'll be giving a fully committed, completely insane performance, which she elaborated on a bit in a recent Rolling Stone interview. "I definitely had to go to some dark, dark corners of my being to embody the one scary character," she said. "It was very intimidating to think of that character as scary or evil, you know those kinds of words I found to be debilitating. So, it was about getting beyond that because when you watch these scary movies, the evil is so ominous that it feels larger than life. To try and embody that can be quite daunting. So, it was about just really deeply investigating the character's emotional motivation and being situated in that, and allowing that to magnify the character." The Oscar winner also offered some interesting insight into Peele's directorial technique, indicating that he uses every tool in his formidable toolbox — including those he picked up as an actor and a comedian — in order to elicit the performances he needs. "One of the things that makes him an extremely incredible director is how compassionate he is, and he has incredible communication skills," she said. "I remember when I met him over lunch… It was a very, very preliminary meeting, and he asked me a question that no director had asked me. He asked me what my process was. What I needed from him as a director… He likes to cater to his actors' processes, and so he approaches directing the actor with whatever way they would work most strongly." She then dropped a fantastic tidbit about how Peele approached the challenge of helping his actors appear to interact with their doubles, for which no stand-ins were needed. "He's a great mimic, as we all know from his incredible work in comedy. So that came in very handy, as well — when we were doing the film playing both characters, he would often do my part for me. And it was incredible to experience him do that. He's so adaptable, which I think is the elasticity of being a performer as well as a visionary director." 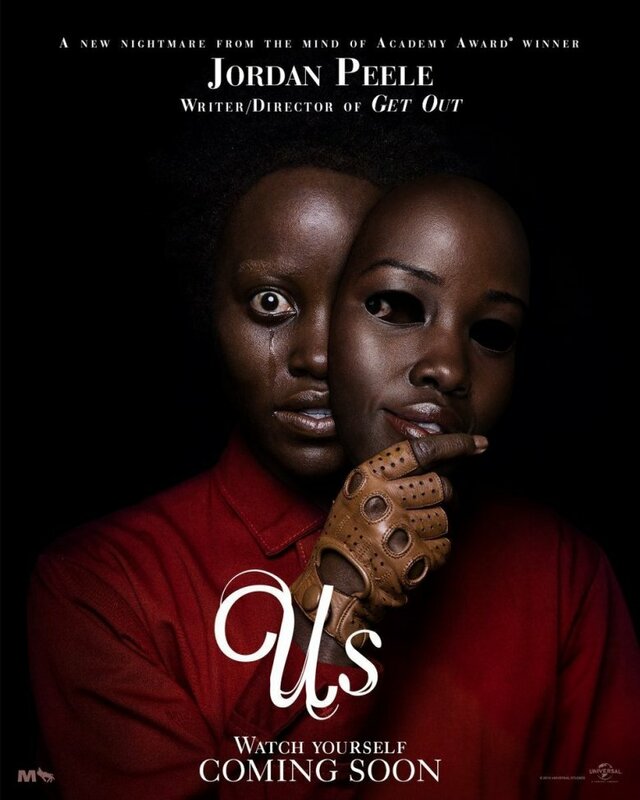 In case you've been under a rock for a few years, Us is Peele's follow-up to his 2017 directorial debut Get Out, a cultural phenomenon which offered pointed commentary on race relations in America by way of a freaky, body-snatching thriller fraught with symbolism and anchored by an incredible lead performance from Daniel Kaluuya (Black Panther). It was perhaps the scariest movie of a year stuffed to the brim with quality horror, and it won Peele an Academy Award for his screenplay; as great as it was, however, it appears that the director was simply warming up to really scare our shorts off with his sophomore feature. Peele has been extremely busy of late. He's an executive producer on no fewer than three forthcoming TV series: the YouTube Premium original Weird City, the HBO horror drama Lovecraft Country, and CBS All Access' reboot of seminal anthology series The Twilight Zone, for which he'll also be filling the late Rod Serling's role as onscreen narrator. But lest we forget that he is also a horror auteur of the first order, Us will serve as a gentle reminder of that fact when it hits screens on March 22. Check out the new poster below — just don't stare at it for too long if you value your sanity.